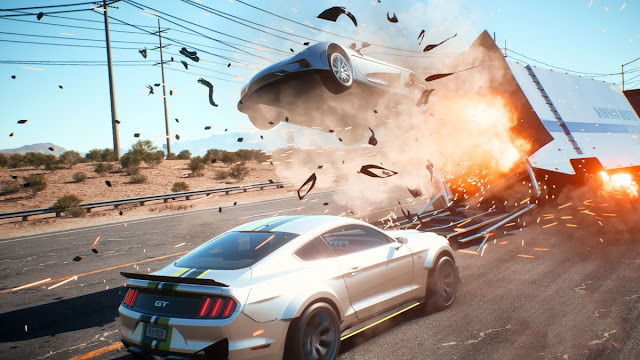 Need for Speed Payback First Updtae Out Now For PS4 ,Xbox One and PC .In this New Update Added New game mode & New Cars . The Speedcross mode is added in this update ,In this mode giving two brand new cars and three cross class asphalt burners to race across 16 new events .Speedcross is a score challenge ,with special areas like Drift Zones ,Jumps and Speedcross added to the track you can get a leg up on your competition.There are even "Smackables" - small ,breakable objects to trash with your car in order to pick up some extra points . Speedcross and it's two new cars are free for those who purchase the Need For speed Payback Deluxe Edition .It will be available as a seperate purchase for everyone else . EA has not specified a price just yet . The First Abandoned Car coming to the game is the Mazda RX-7 Spirit R and you can find it on Dec 19 .In coming weeks you will also be able to add the Volvo 242DL ,Volvo Amazon P130 ,Plymouth Barracuda ,Nissan Skyline 2000 GTR and the BMW M3 Evolution 2 E30 to your garage . The BMW M4 GTS ,M5 ,X6M and M2 are all getting new customization parts ,the Single Player's Drift Trial events are coming to multiplayer as Drift Runs ,and the Logitech G29 and G920 steering wheels are getting official support .